The time has come to sell my baby as she has done me extremely well for the past 5 years I have owned her. Reason for the reluctant sale is because I am upgrading. How much are you looking for ? Hey man, please let me know if you willing to sell the intercooler, intake and rear diffuser separately, keen on those mods. whatsapp me on 074 358 3317. 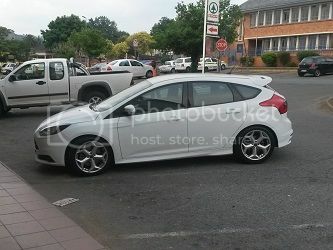 Owjay1 wrote: Hey man, please let me know if you willing to sell the intercooler, intake and rear diffuser separately, keen on those mods. whatsapp me on 074 358 3317.
car and wheels have been sold. you asking how much I got for it or what the replacement is? Hi, sorry to add onto this thread, where did you get the rear spoiler extension from?